“I loved everything about Gingerbread Aliens, especially the picture of Mrs Witherbottom’s bottom – it was really funny! I can’t wait to bake then eat my own gingerbread aliens.” Emma, aged 7. “I loved reading Gingerbread Aliens to my kids! It was very entertaining and I particularly enjoyed all the different characters and exciting plot. I had planned to read it over a few nights but found myself so engrossed in the story that I finished the whole book in one reading!” Helen, mother of 2. “Gingerbread Aliens is about three brothers that make a bet on who can raise the most money at the school fete. So they all go and make their own things to sell. But who will win the bet? And what will happen to the loser? (ha ha) Gingerbread Aliens is a funny and exciting book. I loved the slime, goo and silly putty not to mention what happens to Mrs Witherbottom’s backside. You can never tell what’s going to happen next with its unpredictable ending. I would love to read another book from Sandra Bennett,” Dane, aged 8. “I really liked the book, it was very funny. I liked it when the scientists came, they were acting very funny and they looked good,” Sean, aged 9. “I liked the gingerbread aliens and want to make some on the weekend. I thought the book was funny and the pictures were wonderful,” Owen, aged 6. “I enjoyed reading your book to my son. The illustrations are fantastic and halfway through the book I was still intrigued as to what would happen next,” Michael, father of 2. 5 Star Reviews from Other Authors on their Blogs. their preparations but somehow get sidetracked when something blows up. reader, but it is delightful fun little tale. The only one not entertained is the principal of the school. I was afraid at first the kids would get away with their mischief and that does not set well with me. I totally believe in consequences for actions taken. I was not to be disappointed; it all works out in the end. This is a book many a little boy will love. 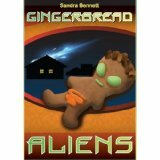 My Review: Sandra Bennet’s humorous tale, “Gingerbread Aliens,” follows three brothers and the trouble they cause, which gets quite out of hand. A simple day of baking turns into a blown out of proportion extravaganza that will get the reader so involved in what is happening at the moment that it will leave the reader wondering what will happen next. My daughter thought the gingerbread aliens looked cute and funny and while the illustrations were not in color, they were well-drawn. I found it interesting that some of the words were done with a different font to emphasize words in the book. All in all, it was an enjoyable book to read. Sandra has told me that it is a book for early readers and reluctant readers who are in between stages from colored picture books to larger chapter book without any illustrations. I think this is a good idea! So what happens when three brothers get together to make their own special creations for a school fundraiser? You can’t begin to imagine!David, Simon and Brian are typical brothers, bickering, laughing, and fooling around with each other. When they all decide to work on their projects on the kitchen counter, they end up mixing up more than just ingredients. They mix up a bowl full of fun the bakes in laughs for young readers.Simon is making a gingerbread alien, Brian is making silly putter, ooze and goo, and David is making bread. When, by accident, silly putty mixes with, bread and gingerbread, hysterical scenarios begin to happen, and just when you think it can’t get worse, it does.A perfect storm, fueled with perfect ingredients, by three young boys, this story is sure to delight.Mix up some fun with your kids, and enjoy reading this one aloud one evening at bedtime. You’ll all love the yuckiness, and the antics of these three brothers. For more Goodreads reviews click on the Goodreads link above.